Have you ever had a thought, idea or dream, that just would not cease to pull at your heart, drawing you in? It’s filling you with passion, determination, creativity, and fulfillment, even if it doesn’t even exist yet? That’s how I felt about the Kula Café and I can’t wait to describe the Café and its work to you today. Several years ago, I went to my friends at Interfaith Neighbors and I told them that I had the idea to do training café for front of house work. 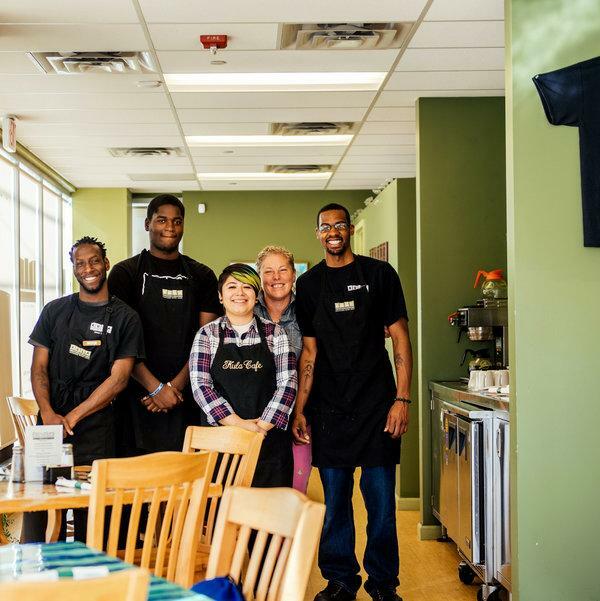 I’d seen that young adults in our community didn’t have opportunities to work in restaurants. At that time a lot of restaurants were opening and this meant great job opportunity, if young people had the confidence and training in hospitality. I am a firm believer in the power of training people in the work of hospitality because it can build confidence, communication skills, and leadership skills. It’s been my experience that if you can communicate in a way to makes people feel good you’re going to find success in what you do. Training in hospitality offers access to a great skill set where people learn to manage themselves in a business, acting a sort of independent contractor in the moment. You have your section, your tasks, and you’re running that part of the business in that moment. I feel that if young people learn these skills they will learn to feel good about themselves and they will then take that into whatever career they pursue. Whether they work in retail, in an office, in a warehouse, in a school, they can take those skills, those abilities, and that confident communication, into that job and create success. When I had the idea for Kula Café, I found that there was not much of that front-of-house training, at least not in my neighborhood. I also knew that, while I loved cooking, not everyone wants be a cook and that is a different skillset all together. When we began, Interfaith Neighbors and I went out into the community to give coffee and hot chocolate to people and businesses in town. The next step was to want to have people in community give to community. There was a good deal of gang activity in Asbury but when the hot chocolate and coffee came by, people of every walk of life would come together to share a cup. This became a time where we realized we all wanted the same things, we just went about them in different ways. Someone might not want to interact with different gangs but both parties want a cup of coffee. So, for a time they’re willing and able to share that space with people whose experience is different than their own. This kind of community effort brings different people together. After the coffee and hot chocolate experience, Interfaith loved the as-yet-unnamed-idea and took it on. For me, travel has always been something I love and I’d always wanted to go on a women’s surf meditation trip. It just so happened that one was available and affordable at that time and so I went to Maui on a retreat that was sponsored by the surf brand Carve. I was there. I was soaking in the Maui sun and so I headed to our first meditation. The topic of that first meditation was on the idea of Kula. Kula is the Hawaiian concept of a community of the heart (We wrap around our community with a passion for that community.) I loved my surf retreat experience (To read more about it, click here ) and returned to Asbury Park with a revitalized spirit, and a name for this place for Interfaith Neighbors: We decided to call it Kula Café. I know it’s not a Jersey word, but it is a beautiful word and a beautiful representation of what Kula offers the community and its people. Kula Café empowers the community grow, to strengthen itself, and to believe in itself. The Kula Café has since been joined by Kula Urban Farm (right beside The Kula Cafe) where greens, microgreens, and edible flowers are grown. They’re then sold and delivered to local restaurants. Kula Urban Farm offers access to locally grown organic produce. The Farm’s work means that more people in the community are involved in knowing where their produce comes from, how it feels, and perhaps even what it means to want to pursue a career in some form related to that sort of work. This work may mean that people, who may not otherwise be exposed to such things, might explore careers in urban farming, horticulture, landscaping, and other related areas. The Café and The Farm are giving the people of Asbury Park the opportunity to discover passion they may not have been Intune with otherwise. Thinking about Kula Café And Kula Urban Farm brings me back to the first time I ever cooked at Oshin. It’s an understatement to say that something was just ignited in me. I know that it was a transformative moment and yet, I am also aware that we don’t always know where that passion will come from. Exposing community youth to new things will be of benefit to them because they will have the opportunity to explore things, all sorts of things: From the beach, to business, to the chance to find desire in ways that were not always full available to the prior generation. When we find ways to provide these opportunities we give everyone in our community a way to look forward to what lies ahead. Kula Café brings in a youthful demographic to explore something that excites and inspires them. The Café is a new, stable, and grounding place for the west side of Asbury. This area is also experiencing the development of new gardens, parks, and affordable housing. It’s a transformation that has just begun with Interfaith Neighbors taking on this project and taking on this corner of the community. Interfaith’s work, and my own, has convinced me that it only takes one person or group to take that leap of faith and hope that others follow. That leap of faith, when made with amazing partners like Interfaith Neighbors, creates a movement.